The findings of the second survey on museum staff demographics carried out by the Andrew W. Mellon Foundation indicate that museums are making some headway on the racial and ethnic diversity of their curatorial and educational staff, but not yet on their C-suite leadership. As readers may remember, another similar survey was done in 2015. Since 136 institutions were represented in both surveys, the comparative measurements provide an accurate view of progress. Done in conjunction with the Association of Art Museum Directors and the American Alliance of Museums, the survey gathers information about more than 30,000 museum employees from 332 museums. The survey does not just measure hiring of people of color overall, where there has been progressive though marginal progress; it also measures representation in “intellectual leadership positions.” There, it has found the proportion of people of color in those positions has increased from 15 percent to 20 percent. These positions are particularly important, because they are considered to be pathways to executive leadership. 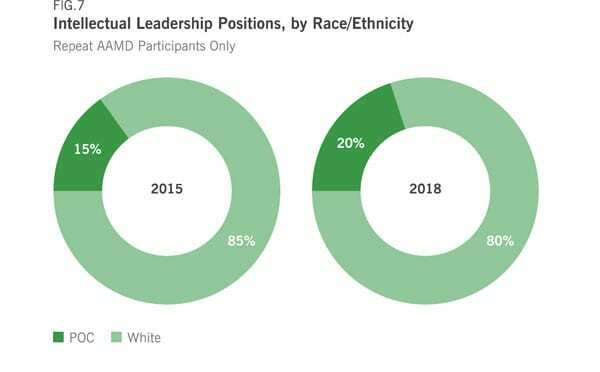 In those executive leadership positions, the needle has moved only slightly, with a one percent increase in the proportion of leadership positions held by people of color. Among the resources in which the foundation has invested is a series of eight museum-based case studies on diversification efforts and a grant pool aimed at helping to diversify museum boards.